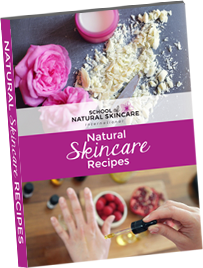 A comprehensive introduction to some amazing natural skincare ingredients – carrier oils, butters, waxes, emulsifiers, preservatives, essential oils and more. Both the practice and theory of making a wide range of luxurious products. 120+ recipes for you to follow or adapt to your own needs. You are a beginner or have been dabbling a bit and now what to learn the theory and practice behind making safe, high-quality natural products (most recipes you find online are not safe!). You want tried-and-tested recipes to get started with straight away. You are primarily making products for yourself, family and friends. Beginners or those with limited experience looking to learn the correct way to make a wide range of products. Take your knowledge and skills to the next level. You’ll learn about a much wider range of ingredients and in greater detail: more carrier oils, butters, waxes and essential oils and an introduction to high-performance skincare ingredients, cosmeceuticals and active botanicals. Instead of following our recipes/formulations, you’ll discover the art of creating your own professional formulations designed to suit your skin type or that of your customers. In the Diploma, we also cover an introduction to the business skills needed and the legalities of selling products. A Diploma in Natural Skincare Formulation certificate upon successful completion of the course. You want to launch your own natural or organic skincare brand. You want to design and create your own unique products using your own formulations rather than following those of others and would like to learn the professional way to create and calculate formulas. You’d like to formalize your current skills and enhance your products. You want to learn the business skills needed, such as finding your target market, your ideal customers, product development and building a brand. You wish to use the training towards your Continued Professional Development (CPD). Beginners or those with some experience looking take their products to the next level. This course bundle is designed to take you from complete beginner with no experience to confident formulator! Start at the beginning with a comprehensive introduction to some amazing natural skincare ingredients – carrier oils, butters, waxes, emulsifiers, preservatives, essential oils and more. Learn both the practice and theory of making a wide range of luxurious products. Practice making products from your choice of 120+ formulations/recipes for you to follow or adapt to your own needs. Then move onto the Diploma in Natural Skincare Formulation, where you will take your knowledge and skills to the next level. You’ll learn about a much wider range of ingredients and in greater detail: more carrier oils, butters, waxes and essential oils and an introduction to high-performance skincare ingredients, cosmeceuticals and active botanicals. Save $100 compared with enrolling on the courses separately. You want to confidently design and make unique products. You want to learn the business skills needed such as finding your target market, your ideal customers, product development and building a brand. Have a question about a taking a course with us?